Join artist, Gina Cannone, and learn how to make convincing, sensitive portraits that are true to life through a coherent, analytical approach to painting. 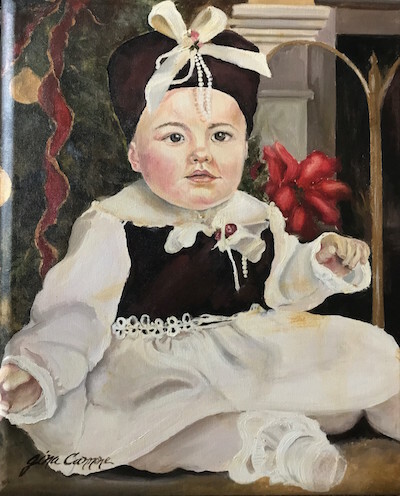 Fundamentals of portrait painting using oil paints or acrylics paints will be emphasized, but more specifically you will focus on learning to see and understand the process of creating a beautiful portrait painting. Through demonstrations and personal critiques, Gina will introduce a variety of topics, including creating a strong likeness with accurate drawing, value understanding based on the effects of light, color mixing, edge manipulation, and cranial structure. This workshop is designed for painters with some experience in oil, however artists with less experience who prefer to work in acrylic paint or pastels are encouraged to participate. This workshop runs for 7 weeks: Friday, October 5 – November 16, 2018. Workshop Fee: $265, excluding materials.